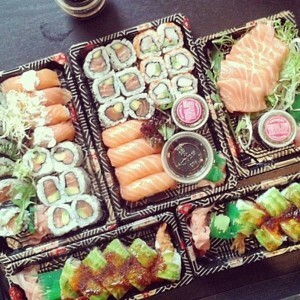 Celebrities who opt for sushi takeaway! Hollywood’s love affair with sushi only seems to be getting stronger and deeper by the day. It’s of course California that we have to thank for much of the world’s newfound obsession with sushi, having propelled it right into the spotlight and made it about the most fashionable food ever created. Back in the UK, the expansion of home delivery sushi has worked wonders for opening up access to the stuff, but it’s still the famous faces of stage and screen that keep on boosting the fashion profile of sushi. From home sushi delivery to the most exclusive restaurants in and around Beverly Hills, sushi seems to be very much the dish to be seen eating if you’re out to maintain a classy image. And that’s exactly why the list of famous sushi fans just keeps on growing by the day – Jessica Biel, Justin Timberlake, Miley Cyrus, Michelle Obama, Victoria Beckham, Robert Pattinson, Jennifer Lopez, Selena Gomez and Richie Sambora for example have all been snapped scoffing down sushi. Even Taylor Swift who once famously said she simply couldn’t force herself to like sushi has come around to its gorgeous goodness in the end, proving that A-Listers are simply powerless to the prestige and glory that is sushi. Which of course leads onto the rather obvious question – why? It’s not as if there aren’t infinite options on the market, so what is it about the sushi takeaway that hits home with celebs? Well, perhaps the most obvious reason of all is how healthy sushi can be. Opt for a sushi delivery in London instead of your usual pizza for example and you could find yourself cutting out hundreds, maybe even thousands of calories every week. And as it’s somewhat in the best interest of celebrities to cut an agreeable figure and avoid piling on the pounds, it’s hardly surprising sushi delivery represents an attractive option. Next there’s the way in which sushi can be eaten pretty much anywhere at any time of the day or night without any fuss or mess involved. You can eat it straight out of the box it comes in, it’s not as if it’s likely to cause any kind of mess and as long as you’ve got some chopsticks to hand, you’re good to go. Celebs often lead very hectic lives…or at least that’s the impression they give off…so in turn the convenience of sushi goes a long way. Last but not least, sushi is still the single most fashionable thing to be spotted and snapped eating. Just being seen eating the stuff is regarded by much of the world as a sign of good taste and sophistication – much more so than getting to grips with a big cheeseburger or tray of chips. To say that famous faces feel it’s important to look good and keep up appearances at all times may be a bit of an understatement to say the least, so it’s hardly surprising that they’d choose the world’s most fashionable food to look good eating!